IAA has negotiated a special guest room rate at the Hilton Fort Worth for $165.00 per night plus tax for a standard single and a standard double. To book your hotel room, please click here to make your reservation online or contact Hilton at 800-445-8667 and tell them you are with the International Anaplastology Association. Internet is included in all rooms with no charge. The special rate ends April 29, 2016. Hilton Fort Worth is a hotel of key American importance and is now a nationally registered historical landmark. After his final night here on November 21, 1963, 35th President John F Kennedy and First Lady Jacqueline spent breakfast in the Crystal Ballroom, with President Kennedy making what would turn out to be his final address to 2,000 visitors. Enjoy your favorites in the Hilton Fort Worth’s onsite Ruth’s Chris Steak House, open for dinner seven nights a week. Café Texas has become a local institution for breakfast and lunch with elaborate buffets and southwestern specialties. The hotel also hosts Starbucks®, with coffee and snacks for you to relax with or grab to go. Work out in the fitness center anytime and enjoy business center facilities. Hilton Fort Worth is a family- and pet-friendly hotel. 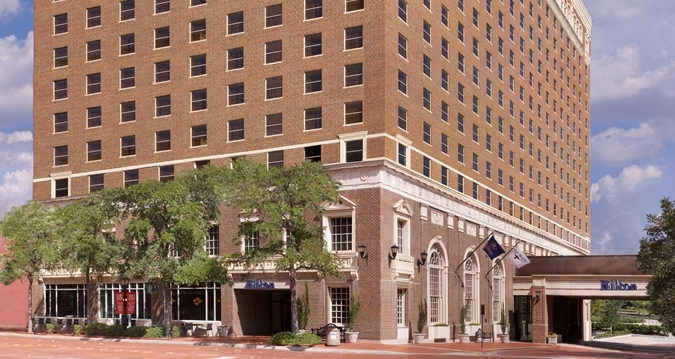 The Hilton Fort Worth hotel’s location in the heart of downtown Fort Worth puts it in the middle of great architecture, art and popular attractions. Downtown’s mixture of cowboy culture and urban sophistication makes it an exciting place to be, with many restaurants and bars in the area. Ft. Worth, named the ‘Number 1 Best Downtown 2014’ by Livability.com, offers longhorns parading through the streets of the Stockyards and top shows at Bass Performance Hall.